NRD has been the Golden Corral Corporate Architect and Engineer for many years. 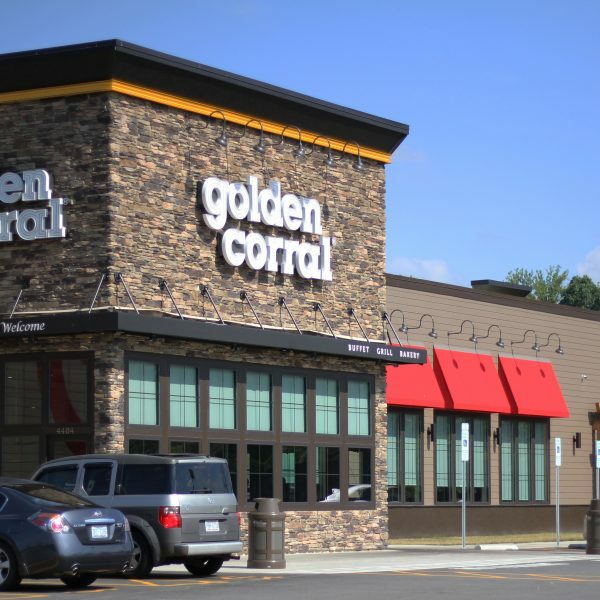 As a fellow NC based company, NRD works closely with the Golden Corral Corporate team to develop, design, and perfect their large buffet concept. In addition to a close relationship with the Corporate office, NRD works with franchisee community not only with new construction projects, but also remodels of original NRD buildings when updates are required. Our long standing relationship and reputation in the Golden Corral community recognizes NRD as the lead source for all design, architectural, and engineering elements of the brand. NRD created the branding design and construction documents for the “Pavilion” prototype, which boasts the largest seating count for any Golden Corral offered prototype. Our day to day responsibilities outside of new construction and remodel includes maintaining all of the current Golden Corral prototypes. Outside of our role as architects & engineers, NRD is an avid supporter of Camp Corral, Golden Corral’s funded national camp grounds for children of injured veterans.